HARLEM CYCLE, http://www.harlem-cycle.com, the first and only boutique indoor cycling studio to offer a rigorous fitness experience in the heart of Uptown Manhattan is celebrating two years of success, soul, and wellness in Harlem. And, on June 20th, the studio will offer $10 classes (5:30 pm and 6:30 pm) to commemorate their 2000th spin class. 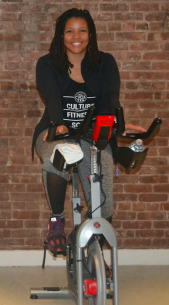 Harlem Cycle, owned and operated by Tammeca Rochester, specializes in helping individuals improve their physical and mental well-being through detailed cardio sessions. “I have witnessed firsthand the stress of my community as it relates to mental health. Harlem Cycle was purposely designed to have a no judgment policy, stress-free, and, no mirrors in the studio. Daily we serve the teacher, writer, executive, painter and everyday people, making them all feel equal and welcomed. This small community focused fitness studio also offers community wellness events that not only focus on fitness but nutrition while making sure to support local Harlem based charities,” says Rochester. Daily classes range from an ultimate conditioning ride to the signature one-hour class where clients are pushed through traditional cycling as well as 30-minute off bike core and strength exercises. Located at 2350 Adam Clayton Powell Junior Boulevard, (137 & 138 streets) Harlem Cycle is open 7 days a week, from 6:30 AM-8: 30 PM. And at $25 per class offers the best get fit music covering genres from soul, jazz, reggae, and hip-hop. Harlem Cycle has been featured in the New York Times, NY Magazine, The Network Journal, Sirius XM, Black Enterprise, Outside Magazine, Curlz and the City and The Coordinated Bride. Tammeca Rochester, former Senior Brand Manager at Colgate Palmolive, turned entrepreneur wanted to create a (more) holistic life as a mom, and that meant stepping away from corporate America. Her clientele now includes Harlem residents, tourists, schools and corporations such as the Harlem Hospital. “Today everyone lives a fast-paced life juggling work, family, and friends often at the cost of their individual health and well-being. Watching the changes going in Harlem have been bittersweet. On one hand, new businesses are coming in and flourishing, on the other hand, longtime residents are being displaced leading to depression and trauma within the community. With the increase in the number of suicides, it is important now more than ever to find a space that allows people to actively work on their physical and mental health without judgment,” says Tammeca. Unlike other cycling studios, Harlem Cycle—a minority-owned and operated establishment—is committed to providing an approachable, non-competitive, community environment. This distinct ethos can be seen in the studio’s four core principles: Culture, Convenience, Commitment, and Community. Uptown residents deserve the very best in holistic health and fitness options. Now, with Harlem Cycle, they have them! Culture. Fitness. Soul. To learn more about Harlem Cycle, visit their website, http://www.harlem-cycle.com.